Cherry Red Records is reissuing this album with a nice booklet and multi-layer digi-pack. When Tony Kaye left Yes he became the keyboardist in this group. They released this debut album (Yes, a live album as a debut) to showcase their sound. Interestingly enough, the gig at which it was recorded was one of two at London’s Rainbow when they were opening for Yes. Some of that band’s Yessongs album was recorded the same night. Honestly, if it weren’t for Kaye’s involvement in Yes, this would probably not land under progressive rock. It’s more psychedelia meets jam band, but there is some prog here. It should be noted that the recording quality of the show is good, but not studio quality. Imagine combining early Yes with Santana and some R&B. You’ll have a good idea of what this song sounds like. It has some smoking hot jamming with both the guitar and the organ really weaving some classic melodies. The mix of sounds here is perhaps the same. Still, there is a bit more of a jam band kind of thing going on here. It definitely feels like psychedelia in a lot of ways. I dig the jam session mid-track. It’s one of the best musical passages of the disc. I also love the synthesizer solo section around the five minute mark. This is one of the most easily accessible things here. It makes me think of the band H.P. Lovecraft to a large degree. It has some great song construction and the jamming is top-notch. In some ways, this doesn’t seem to work as well as some of the rest. That said, the psychedelia meets jam band kind of vibe does gel at times. There is a bit of a Doors element here at times. Now, this one is really classy. There is a bit of a soulful element here. The song just really rocks. It has a lot of style and charm. This might be my favorite tune here. I love the vocal arrangement. The whole song is just very cool. It’s got a dramatic psychedelic rock sound to it. The instrumental sections take it closer to prog (and particularly early Yes) than anything else here. Brian Parrish is possibly best known for his work as part of the band Badger. This new solo album shows that he’s got what it takes to deliver great music on his own, though. If you were to just listen to the first song or two, you might think that this is an AOR prog disc. The first part of the album fits in that category. Beyond that, though, this is more of a mainstream blues rock disc. It’s a very strong one, too. This comes in mellow, atmospheric and trippy. It works to a great fairly mellow groove for the song proper. There is a definite Pink Floyd kind of thing here, but with more of a psychedelic rock edge. The chorus hooks and other elements seem to bring an AOR rock element, too. This has a harder edged groove that’s very tasty. I really dig the tasty guitar solo later in the piece. Perhaps this is more mainstream rock than prog, but there are elements that make me think of both Pink Floyd and Supertramp in some ways. A bluesy rock tune, this is another classy number. I love the guitar sounds on this thing. There are some hints of psychedelia at times, along with hints of world music and prog. The world music jam at the end is definitely progressive, if perhaps not progressive rock. Either way it’s great. A pure old school blues rock jam brings this into being. There is a bit of a Grateful Dead vibe to it in some ways, too. There is definitely a soulful thing at play here. This cut has no prog at all in the mix. It’s closer, perhaps, to something Eric Clapton might do than it is to anything else. Now, this blues tune is classy for sure. I like the retro organ, and the whole thing feels like an electric blues thing from the 1970s. It’s quite cool. The female vocals add a lot, but the tune just oozes cool, anyway. The horns really add a lot to this. There is a lot of funk along with soul and more. It’s very mush a 70s kind of groove. It’s classy stuff, too. A slower, mellower pure blues tune, this is so strong. It has some especially tasty guitar soloing. Here’s a more energized, but no less bluesy tune. It’s a cool rocker that is very much a timeless kind of thing. Again Eric Clapton is a good reference. A mainstream rocker, this still has a lot of blues in the blueprint. It’s a solid rocker. It’s not one of my favorites here, though. The saxophone solo is a nice touch. More of a pure blues tune, this has a lot of Eric Clapton in the mix along with some BB King. This is one of my favorites of the set. There is a bit of a country edge to this mellower tune. It’s another class act, though. There is something a bit like Pink Floyd in this tune, too. That’s tempered by more of a pure blues sound. Either way, this another cool tune. It has some nice touches for sure. Folk and country merge on this mellower number. It’s very old school in sound. ESOTERIC RECORDINGS are pleased to announce the release of a newly remastered edition of the classic 1973 live album by Badger. Noted for their connection with the legendary YES, the band featured former Yes keyboard player TONY KAYE and bass guitarist and bass guitarist DAVID FOSTER (formerly in The Warriors with Jon Anderson and co-writer of ‘Sweet Dreams’ and ‘Time and a Word’ for YES), along with guitarist / vocalist BRIAN PARRISH and drummer ROY DYKE. 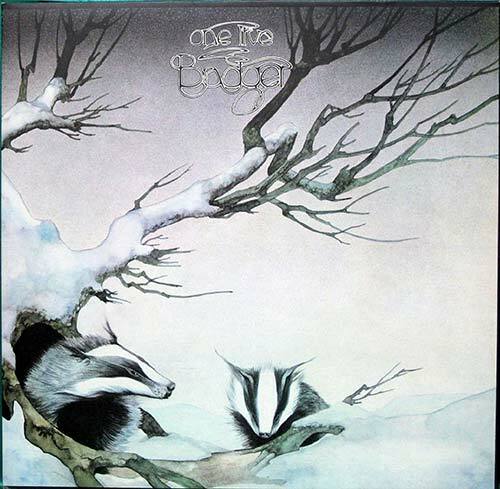 Recorded in December 1972 at The Rainbow Theatre in London (when Badger supported YES on two shows that were filmed for the “Yessongs” concert movie). The band were warmly received as an opening act and their live performances were well crafted, encouraging Atlantic Records to offer a contract to release the highlights of Badger’s live set as a live album which was co-produced by JON ANDERSON. “One Live Badger” featured material such as ‘Wheel of Fortune’, ‘Wind of Change’ and ‘On the Way Home’ – fine tracks driven by Tony Kaye’s Hammond organ and Mellotron playing – and was greeted with enthusiasm by the Yes fan fraternity. This Esoteric Recordings edition is the first official UK CD release of the album and has been re-mastered from the original Atlantic Records master tapes. It includes a booklet featuring Roger Dean’s original album artwork (officially reproduced for the first time) and an essay. 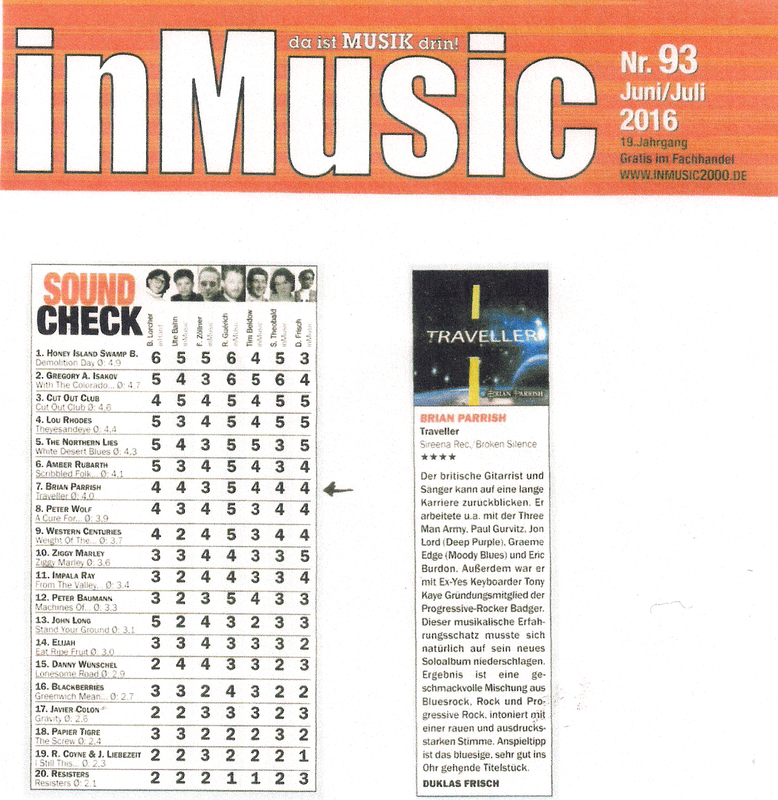 Der Country-inspirierte Solo-Musiker Brian Parrish taufte sein 2016 erscheinendes Album auf den Namen „Traveller“. Er kombiniert dabei die Genres Country, Blues, Folk und Pop, indem er sowohl seine einzigartig rauchige Stimme, als auch sein Talent für die Kunst der Gitarre einsetzt. Bereits auf den Konzerten, die Brian Parrish vor Erscheinen seines Albums „Traveller“ gab, konnte sich der Solo-Künstler eine beständige Fan-Basis aufbauen. Die Songs des Country-Stars bestehen größtenteils aus Gitarre und Gesang, wobei stellenweise ein Schlagzeug im Hintergrund auftaucht. Parrish bedient sich beim Gitarrenspiel der Fingerstyle-Technik und erschafft somit einen unverwechselbaren Stil. Seine rauchige Stimme singt klagend über Herzschmerz, Fernweh und alltägliche Sorgen. Hierdurch schafft es Parrish, den Hörer auf einer sehr persönlichen Ebene anzusprechen. Sämtliche Songs wurden natürlich in höchster Qualität aufgenommen, was ein mehrfaches Hören des Albums „Traveller“ problemlos möglich macht. Für Country-Fans ist das Album „Traveller“ ebenso zu empfehlen wie für Pop-, Blues-, und Folk-Hörer. 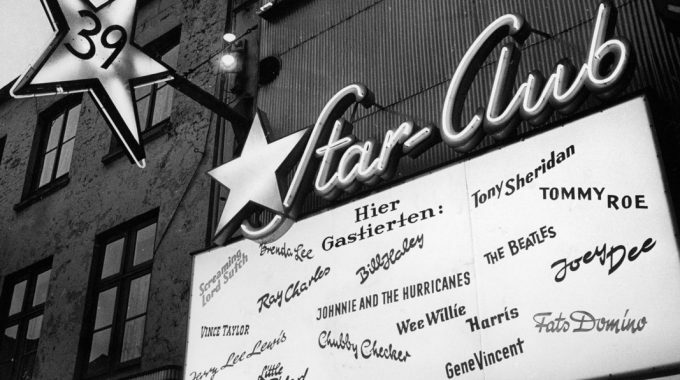 Im Jahr 2004 kam Brian Parrish im Zuge eines Starclub Special-Konzertes nach Deutschland zurück, wobei es ihm hier so gut gefiel, dass er seither im norddeutschen Worpswede wohnhaft ist. Dort entstand dann auch das Material zu seinem neuen Studioalbum „Traveller“, für das er sich einige helfenden Hände ins Studio geladen hatte. Um nur mal zwei Beispiele zu nennen, sind hier Blue Weaver (Ex-Strawbs, Ex-Chicken Shack, Ex-Mott The Hoople) an den Keyboards und derVelvetone-Schlagzeuger Steff Ulrich mit am Start. „Traveller“ ist ein sehr persönliches Album geworden, auf dem Parrish viele Stationen und Erkenntnisse seines Lebens nochmal in Erinnerung ruft und verarbeitet. Musikalisch präsentiert er das Ganze in einem poprockigen Stil, gewürzt mit der einen oder anderen Dosis Blues und auch Soul. Die Stücke kommen zumeist im Midtempo und auch wenn dieser Vergleich hinkt, erinnern sie von der Ausrichtung an das (poppige, relaxte) Spätwerk eines Eric Clapton. Gitarristische Vergleiche müssen hier auch gar nicht erst angestellt werden, denn dafür sind die Soli von Parrish zu dezent angelegt und auch die Keyboards nehmen eine größere Rolle im Gesamtsound ein. Rein gesanglich gesehen ist die Scheibe zwar kein Höhenflug, aber auch kein Reinfall. Die Stärke von „Traveller“ liegt vor allem in dessen Gänze, wenn die einzelnen Zahnrädchen ineinander greifen, sich der Groove, die musikalische Umsetzung und die Texte miteinander verbinden. Sehr erfrischend kommen bei vier Titeln auch die beiden Background-Ladies Claudia Brinkmann sowie Mel Stahn (nicht immer als Duo) zum Einsatz. Die Produktion ist bis auf zeitweise etwas mechanisch klingende Drums („Land Of The Night Games“, da wurde wohl eher ein Sample vorgezogen) sehr gelungen und auch die Arrangements gefallen und gehen sehr gut ins Ohr. Letzten Endes kann man wohl resümieren, dass „Traveller“ von Brian Parrish ein aufgeräumtes, unaufgeregtes und dennoch sehr inspiriertes Album geworden ist. Wirklich heraus stechende Songs sind zwar nicht unbedingt zu finden, aber das muss ja auch nicht unbedingt der Fall sein, um von einer Scheibe überzeugt zu werden. Reinhören empfiehlt sich – wie so oft – auch hier, bevor man sich das Teil in die Anlage wirft bzw. ins Regal stellt.